Aircraft ownership is a serious undertaking, and you should be familiar with the obligations and responsibilities of aircraft ownership before you make the decision to purchase an aircraft. Aircraft owners have a variety of responsibilities that have their foundation in the Code of Federal Regulations (CFR). Some of these documents are addressed in this section, and others are covered in later posts. 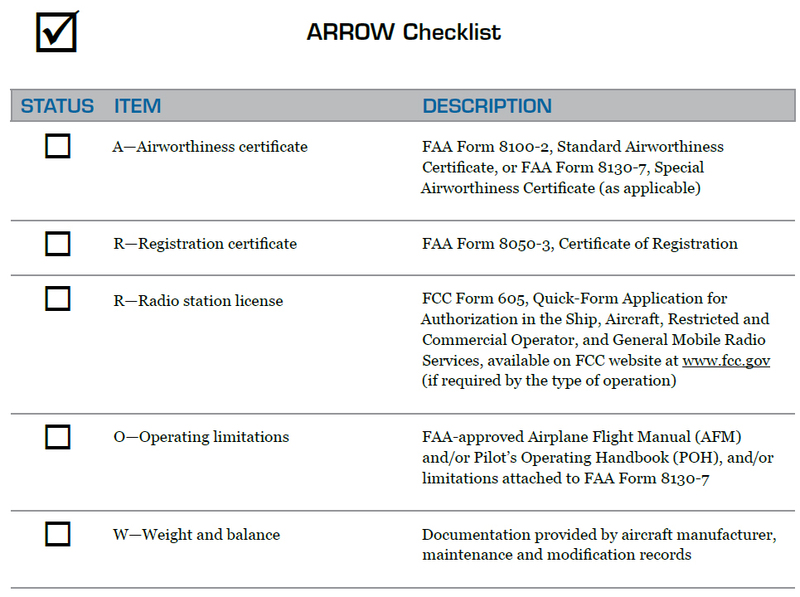 Figure 1-1 at the end if this post is an ARROW checklist you can use to ensure you have all of the required documents. 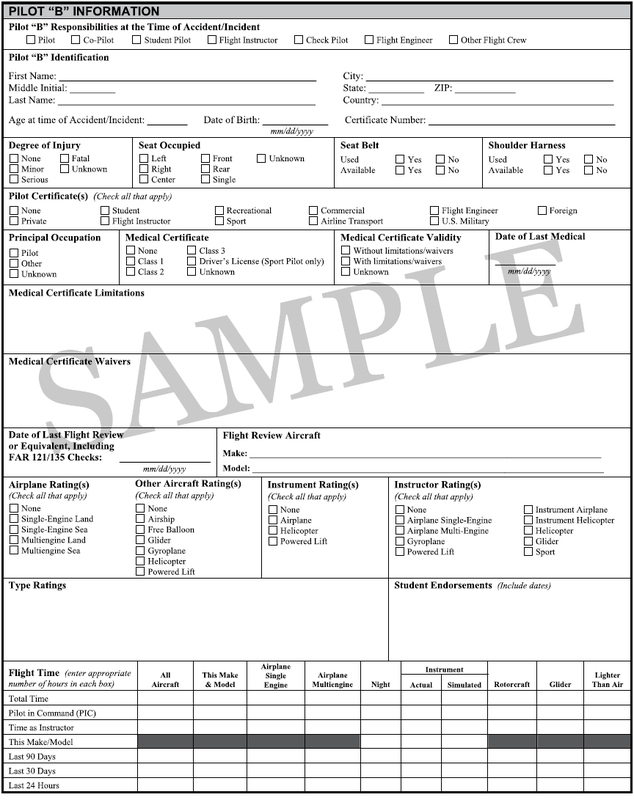 You can expect an FAA aviation safety inspector (ASI) to ask for these documents any time he or she is inspecting your aircraft and/or assisting you with a question regarding your aircraft. Figure 1-1. ARROW Checklist. 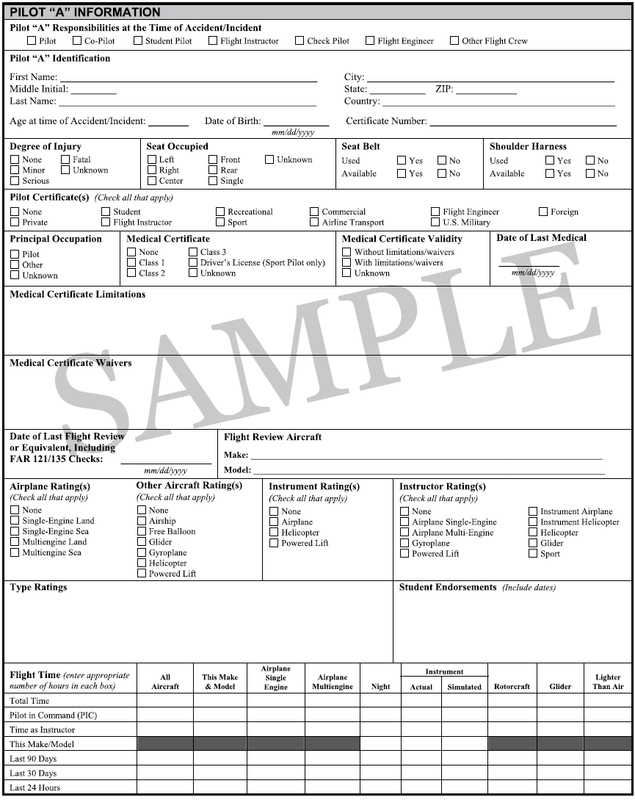 You can use this checklist to ensure that you are carrying the appropriate documentation onboard your aircraft at all times. CAUTION: A radio station license is required for any international operations. You must complete an FCC Form 605, Quick-Form Application for Authorization in the Ship, Aircraft, Amateur, Restricted and Commercial Operator, and General Mobile Radio Services, available at www.fcc.gov to obtain an FCC radio station license. 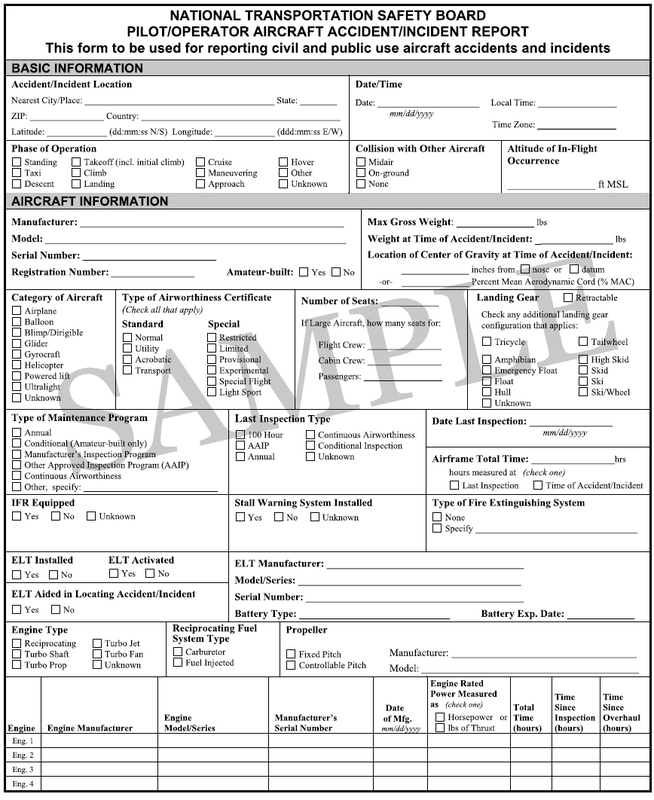 The FAA Civil Aviation Registry Aircraft Registration Branch (AFS-750) maintains registration records on individual aircraft and serves as a repository for airworthiness documents received from FAA field offices. 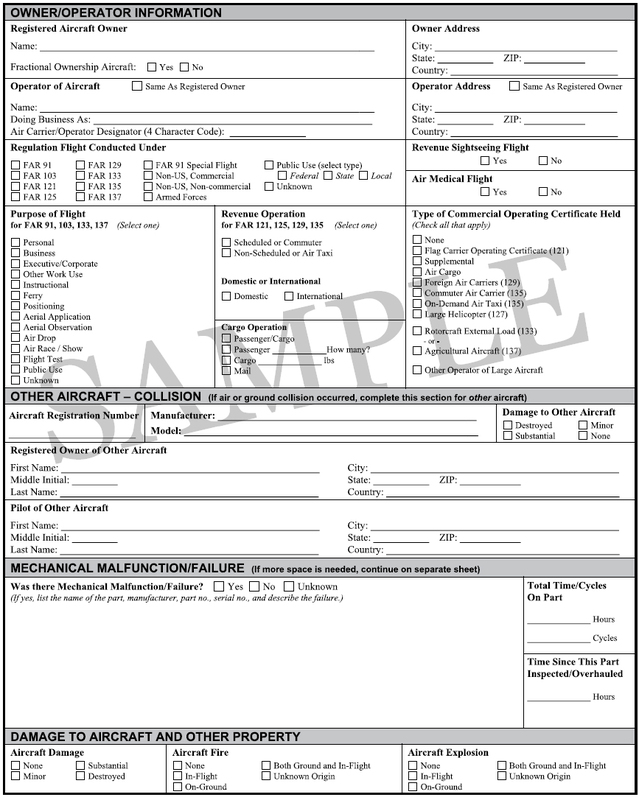 As an aircraft owner, you are responsible for immediately notifying AFS-750 of any change of permanent mailing address, the sale or export of your aircraft, or the loss of your ability to register an aircraft in accordance with Title 14 of the Code of Federal Regulations (14 CFR) part 47, section 47.41. Figure 1-2 at the end of this chapter is a sample FAA Change of Address Notification you can use to inform AFS-750. Aircraft registration is addressed in more detail in the post on Aircraft Registration. Figure 1-2. 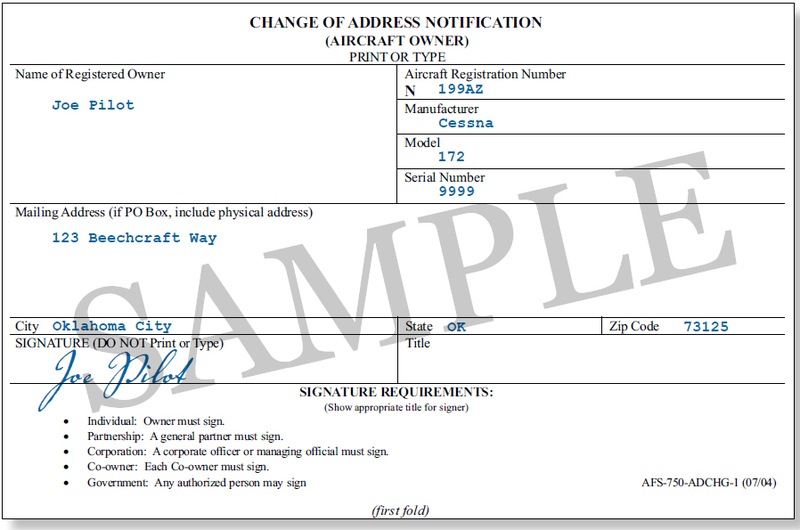 FAA Change of Address Notification (Aircraft Owner). You can obtain instructions for completing an FAA Change of Address Notification on the FAA website at www.faa.gov or from your local FSDO. 14 CFR includes rules prescribed by the FAA governing all aviation activities in the United States. A wide variety of activities are regulated, such as airplane design, typical airline flights, pilot training activities, hot-air ballooning, and even model rocket launches. The rules are designed to promote safe aviation while protecting pilots, passengers, and the general public from unnecessary risk. As an aircraft owner, you are responsible for compliance and familiarity with the applicable 14 CFR part(s) concerning the operation and maintenance of your aircraft. While the regulations cited below are not exhaustive, they are a starting point as you consider aircraft ownership. It is essential that you remember that you are responsible for complying with all 14 CFR parts applicable to your aircraft and aircraft operations. As an aircraft owner, you should be familiar with the provisions of 14 CFR Part 43, Maintenance, Preventive Maintenance, Rebuilding, and Alteration, and 14 CFR Part 91, General Operating and Flight Rules. If you are also a pilot, you should be familiar with the provisions of 14 CFR Part 61, Certification: Pilots, Flight Instructors, and Ground Instructors, and 14 CFR Part 67, Medical Standards and Certification. Questions regarding 14 CFR can be addressed to your local Flight Standards District Office (FSDO). 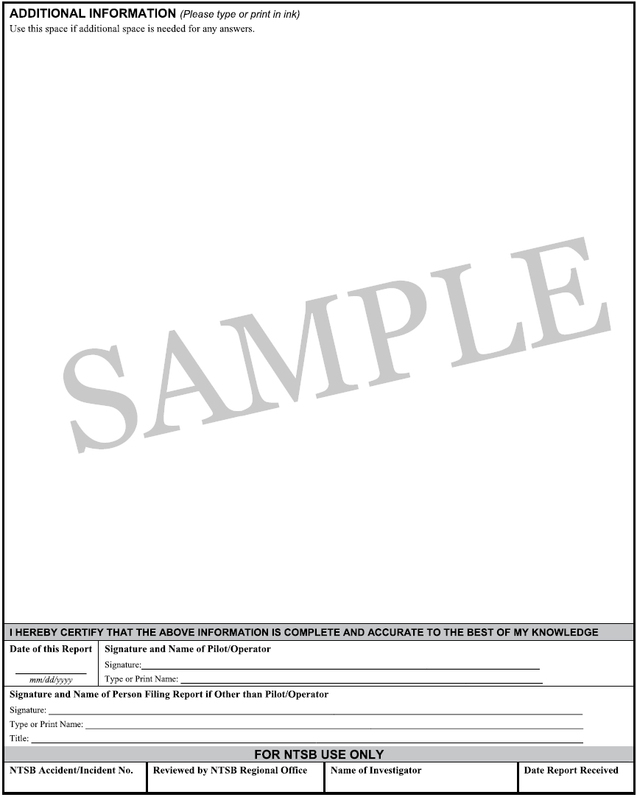 Information about obtaining copies of 14 CFR parts and FAA publications can be found in the post on Obtaining FAA Publications and Records. Each aircraft has a unique set of logbooks that document historical data dating back to the manufacturing date of the aircraft. As an aircraft owner, you have a regulatory obligation to ensure that your logbooks are complete and kept up to date. Aircraft logbooks enable the aircraft owner to keep records of the entire aircraft in chronological order including: inspections, tests, repairs, alterations, Airworthiness Directive (AD) compliance, service bulletins, and equipment additions, removals, or exchanges. Most logbooks also include sections for major alterations and altimeter/static system checks. Anyone performing maintenance on your aircraft will need complete aircraft logbooks to review the aircraft’s compliance history before performing maintenance on your aircraft. Information about aircraft maintenance and aircraft maintenance records can be found in the posts on Aircraft Maintenance and Maintenance Records. Aircraft insurance is an important consideration for any aircraft owner. The type(s) and amount of insurance you should carry on your aircraft are influenced by several factors, and you should discuss these decisions with an insurance agent familiar with providing aviation insurance policies. Depending on the usage of your aircraft and who might be flying the aircraft, you may need Owners, Renters and/or Certified Flight Instructor (CFI) insurance policies for your aircraft. Responsible aircraft owners always carry sufficient insurance on their aircraft. CAUTION: You should ensure that you are in compliance with any state insurance requirements relating to aircraft ownership. Aircraft owners are responsible for complying with Title 49 of the Code of Federal Regulations (49 CFR) part 830 regarding the reporting of aircraft accidents and incidents. You are required to notify the National Transportation Safety Board (NTSB) immediately of aviation accidents and certain incidents. 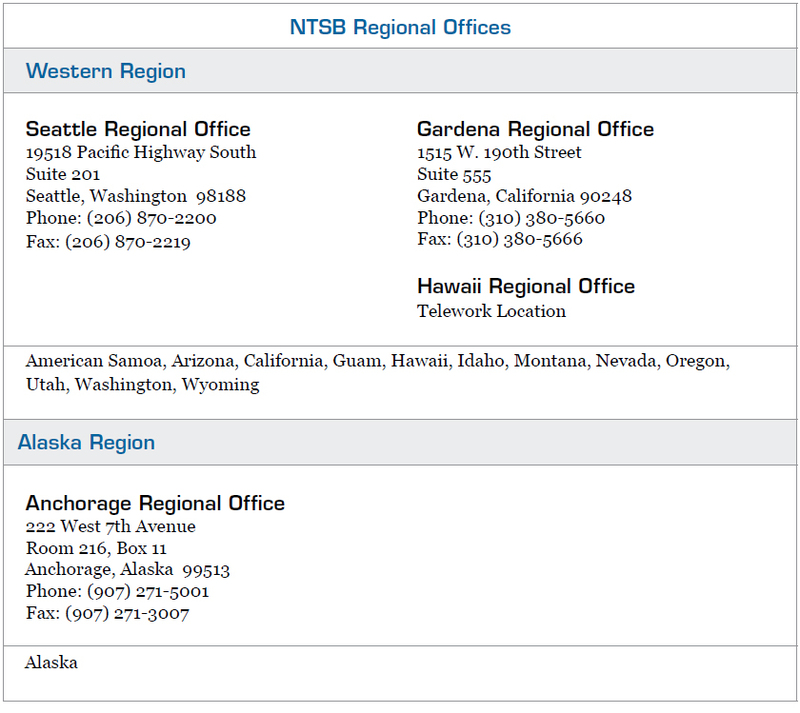 Contact information for the NTSB regional offices is located at the end of this post in Figure 1-3 and on the NTSB website at www.ntsb.gov. Your local FSDO can also direct you to the correct NTSB regional office in the event of an aircraft accident or incident. Figure 1-3. NTSB Regional Offices. 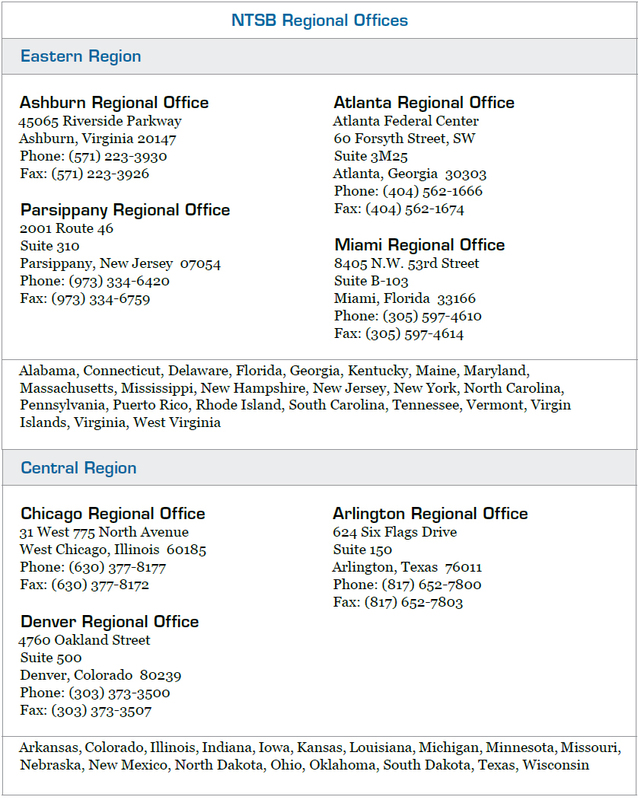 The updated list of NTSB Regional Offices, including office hours, is available on the NTSB website at www.ntsb.gov. Figure 1-3. NTSB Regional Offices (continued). For the purpose of notifying the NTSB, a phone call is sufficient initially, but a written followup is required. 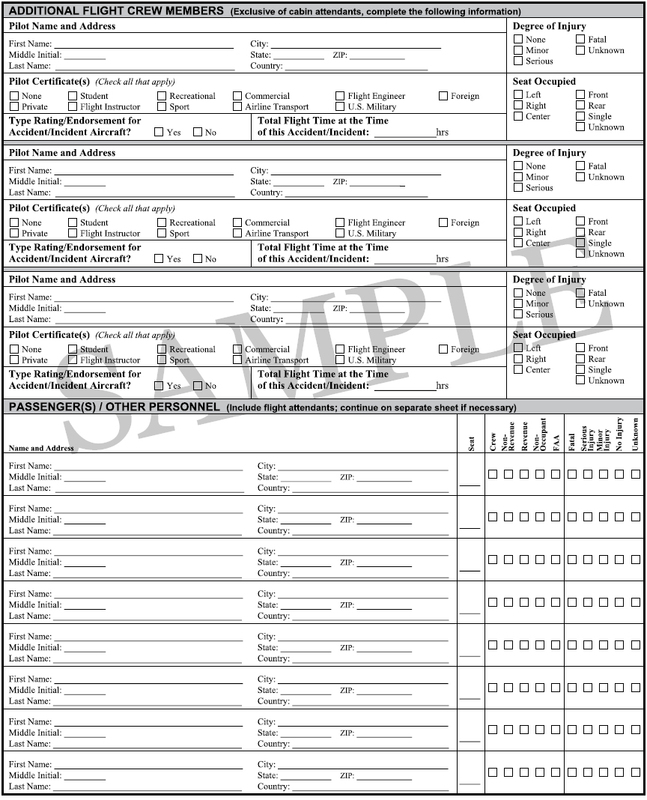 You will probably be directed to complete NTSB Form 6120.1, Pilot/Operator Aircraft Accident/Incident Report, which is available on the NTSB website at www.ntsb.gov, from the nearest NTSB regional office, or from your local FSDO. 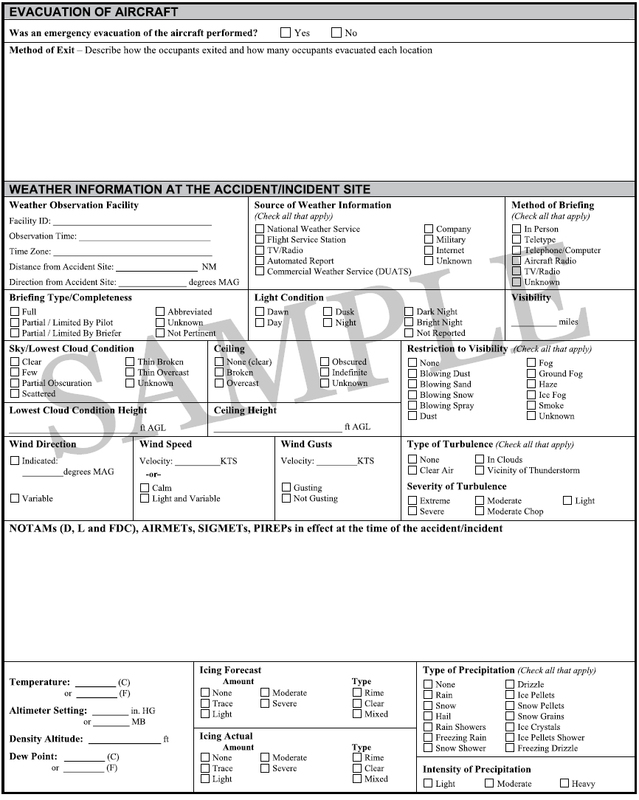 In accordance with 49 CFR part 830, section 830.5, you must file a report with the NTSB regional office nearest the accident or incident within 10 days after an accident for which notification is required. 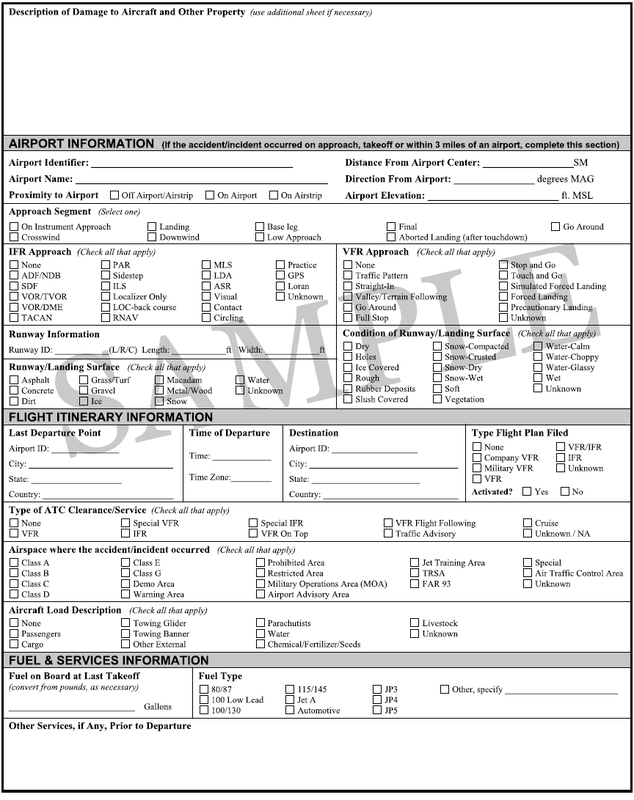 Complete Form 6120.1, sign it, and send it by mail or fax to the applicable NTSB regional office. 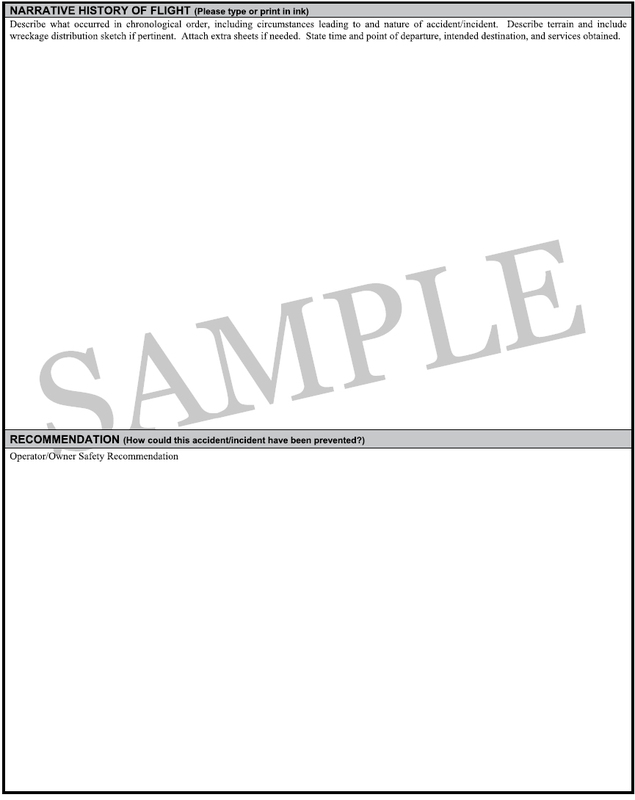 Figure 1-4 at the end of this chapter is a sample NTSB Form 6120.1. Figure 1-4. NTSB Form 6120.1 (page 2 of 9). Figure 1-4. NTSB Form 6120.1 (page 3 of 9). Figure 1-4. NTSB Form 6120.1 (page 4 of 9). Figure 1-4. NTSB Form 6120.1 (page 5 of 9). Figure 1-4. NTSB Form 6120.1 (page 6 of 9). Figure 1-4. NTSB Form 6120.1 (page 7 of 9). Figure 1-4. NTSB Form 6120.1 (page 8 of 9). Figure 1-4. NTSB Form 6120.1 (page 9 of 9).